For general information about ways to get involved and what you can do to help advance research, please click here. As technology is becoming increasingly fundamental in our lives, understanding more about how it can help will be just as important. This exciting new study “Intelligent Parkinson early detection guiding novel supportive interventions” is looking to identify differences in the patterns of participant phone use which may be with known Parkinson’s symptoms. CPT’s Research Committee meets quarterly (in London) to assess the scientific quality of research applications received into the charity. We are currently inviting expressions of interest from an individual living with Parkinson’s, who has scientific interest in Parkinson’s to join the Committee. Meetings are held four times a year in London. We are looking for people with Parkinson’s who are over 50, diagnosed less than 10 years ago, based within the M25 to take part in an innovative and engaging study at UCL, London. Click here to find out more about getting involved. CASPAR is a Phase 2b study that is currently recruiting in Newcastle, Plymouth and London with the aim of investigating the efficacy and safety of three fixed doses of BEN2001 (0.5, 1 and 3 mg/d) compared to placebo for the treatment of excessive daytime sleepiness (EDS) in people living with Parkinson’s disease. 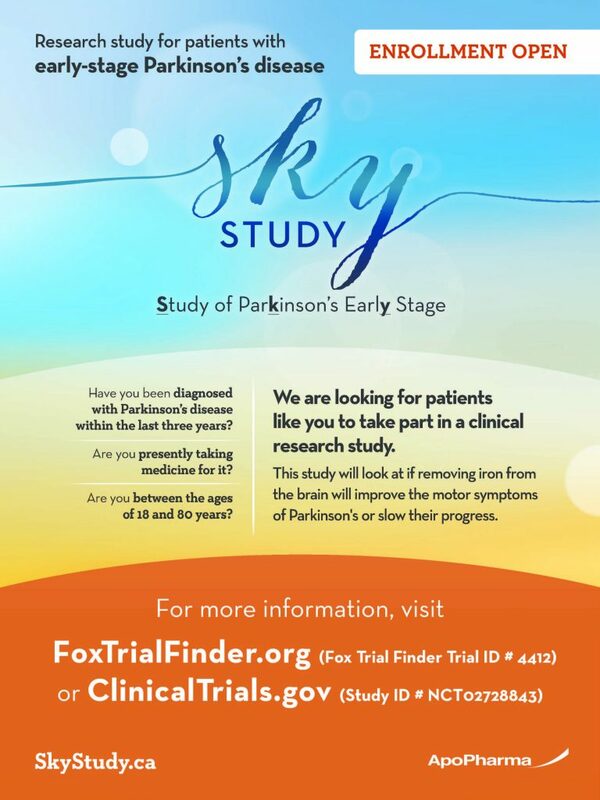 The Parkinson Study Group (PSG), under the direction of Tanya Simuni, MD (Northwestern University) is conducting a multi-center, randomized, double-blind, placebo-controlled study of nilotinib in individuals with Parkinson’s disease (PD). The purpose of the NILO-PD study is to determine if nilotinib is safe, if it can be tolerated by patients with PD and to learn if nilotinib has the possibility of effectively treating PD symptoms. Twenty-five sites will enroll participants into 2 cohorts, approximately 75 in Cohort 1 and 60 in Cohort 2. Cohort 1 will be enrolling first and participants will have moderate to advanced PD. Cohort 2 will enroll after the completion of Cohort 1 and participants will have early PD. NILO-PD is being conducted under a research grant award from the Michael J. Fox Foundation for Parkinson’s Research. Take part in a UK multi-centre study looking to find new genes that contribute to Parkinson’s disease risk and clinical features. In the last few years our understanding of the causes of Parkinson’s has rapidly developed, and now we need to translate that understanding into treatments that slows the progression of the condition. We now believe that there are many different causes for example we know that variants in mitochondrial genes can cause specific forms of Parkinson’s. Mitochondrial genes control the mitochondria which create energy within the cells. What we learn from genetic forms of Parkinson’s may also be relevant for other forms of the condition. The aim of this study is to collect information and samples from people with Parkinson’s and attempt to group and stratify people with Parkinson’s based on markers of mitochondrial dysfunction. The investigators are studying people with both genetic forms of Parkinson’s and those with idiopathic Parkinson’s (i.e. where the cause is not known), as well as a healthy control group. All groups will undergo standardised clinical assessment to collect information on several aspects of their condition and will be asked to provide blood, urine and optionally cerebrospinal fluid and skin samples from which various biochemical and genetic tests will be performed. All participants will be asked to fast overnight (10 hours) before the study appointment, but all medications can be taken with water. Fasting is required as some of the tests are sensitive to different types of food so can affect the results. The investigators are particularly interested in those with known genetic causes of their PD such as Parkin and PINK1 carriers, as well as people with early onset Parkinson’s (diagnosed when less than 40 years old) and healthy controls can be non-blood relatives such as wives, husbands or friends. Study appointments will take place at the Royal Free Hospital in London. Up to £50 of travel expenses can be claimed to attend the visit. Please click here for the Movement Disorders Centre at the UCL Institute of Neurology, to explore all of UCL open research studies. The 100,000 Genomes Project only remains open until 30th September. If you have early onset Parkinson’s or atypical Parkinson’s (onset 45 years of age or under or history of Parkinson’s disease in the family), are based in the UK and would like to contribute your genetic data to this pivotal government funded study please do e-mail helen@cureparkinsons.org.uk and we can direct you to the investigators who can provide postal consent forms. Participation involved providing a blood sample via your GP or local consultant. Please explore and take part in the open surveys advertised on our Parkinson’s Movement website. Five ambassadors needed for participant recruitment to The Michael J Fox Foundation’s comprehensive, international online clinical study, Fox Insight – click here to find out more. Creating factsheets about collecting genetic information from people with Parkinson’s. Please e-mail advocacy@cureparkinsons.org.uk for more information.